I’ve been a bit of a crafty slacker lately. The main reason is likely my entanglement with the Twilight series. I just couldn’t get anything else done while I was reading those books. It seemed like the best thing to do was just let it take over and read all the books as quickly as possible, so that I could get back to life in the non-vampire world. I finally finished last week. (Thank you to my Twilight enablers – mb & Gillian) Plus, last night I finished reading the online manuscript for Edward’s side of the story, Midnight Sun. Soo good. What I wouldn’t give to re-read the entire four books from his perspective! It’s been mildly embarrassing to tell people that I haven’t really been making anything because I’ve been hanging out with vampires in my mind, so it’s time to get my craft back on! The freshly re-designed Toronto Craft Alert is having a fun contest right now to get people motivated to finish up abandoned projects. (which we ALL have) The Crafty Slackers Get ‘Er Done grand prize is amazing and even includes some choice items donated by the workroom. 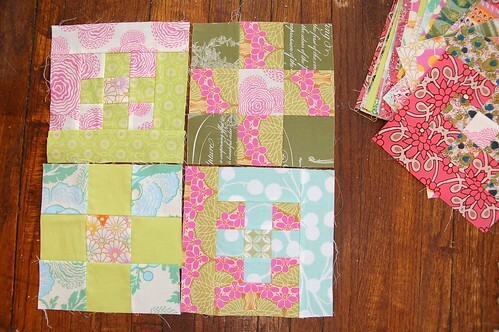 This pink and green quilt was started in the Nine Patch Quilt class back in May! 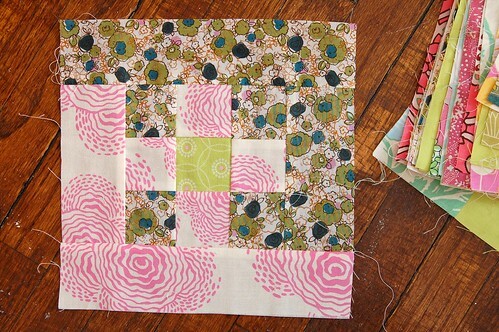 I got really ambitious when I found out how fun the nine patch is to make and imagined a huge queen-sized quilt. I’ve since accepted the fact that not EVERY quilt I make needs to be a queen-sized quilt. My goal is to just use up the pre-cut squares of fabric that I’ve got ready to go. I don’t have any illusions of finishing this project completely by the March 16th deadline, but I’d really like to make some headway on it. At the very least, I’ll complete the top and the back. I have been totally slacking as well this month. In fact, I hadn’t been in the Workroom for over a month until I was in this weekend – it was like coming home! This Toronto Craft Alert contest is great motivation – I have a doll who needs to be stuffed and a baby quilt waiting to be finished. Now, I only wish they had contests like this to motivate me to do all the things in my life I have left undone – like the ironing and writing my thank you cards from Christmas (oops). I can’t wait to see how this turns out! I can tell I’ll love it, because I recognize several of those fabrics from my own stash. 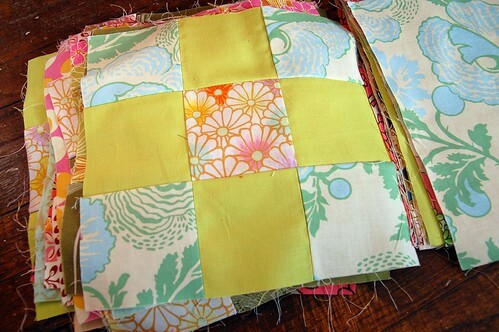 And I have a quilt tucked away that I really, really need to get around to working on. I had completely forgotten about Edward’s side of the story! I guess I will have to postpone my English paper piecing project a tiny bit to read it. I admit I have been slacking as well. The TCA challenge is a huge awesome incentive but it’s been difficult just starting on my projects again. It will happen. and then, whilst making my escape, i *may* have mentioned something about popping into the library…. lauren – we’ve missed you around the workroom and i’m sorry i missed you on sunday. it sounds like you’re keeping busy in other departments though, so that’s good. see you soon! rachel – i have a particular fondness for pink and green since it was the colour scheme of my childhood bedroom. i’m a bit worried though that this is going to be ultra busy-looking. michelle – edward’s story is really good! and i want to see more of your cross stitch work! A friend of mine gave me the link of your website … and waouhhh I found your blog and this pattern is just terrific – it is so original – nice colors, a nine patch so different of what I usually see!